Lovely lodge with elevated view and breathtaking sunsets. The lodge consists of 4 en-suite bedrooms, loft bedroom, 360-degree fireplace, air-conditioned, lounge, dining room, entertainment area, kitchen with scullery, internal built-in-braai, plasma screen, pool table with other entertainment facilities, jacuzzi, rim flow swimming pool, bar, highest quality furniture & game drive vehicle. 8% Share entitles the owner to 4 weeks per annum. First storey feature 2 ensuite bedrooms each with its own balcony and 2 store rooms. Second storey is the entertainment area with open plan living room with magnificent fireplace, dining room, kitchen a large deck area leading out to the Boma and swimming pool. Third storey feature 2 ensuite bedrooms with own balconies. The house comes fully equipped all you need to bring is your clothes and food. Each shareholder are provided with a lockup area to leave their personal belongings. Hidden away on the edge of a valley is this charming four bedroom residence creating its own lush, leafy oasis. On the entry level is a open plan lounge complete with fireplace, dining room, kitchen and recently remodeled bathroom. This open plan living space is awash with natural light from the wide windows. Beyond the glass: a garden of eden, two entertaining decks and a swimming pool and Boma area. Upstairs is a lavishly decorated ensuite bedroom. 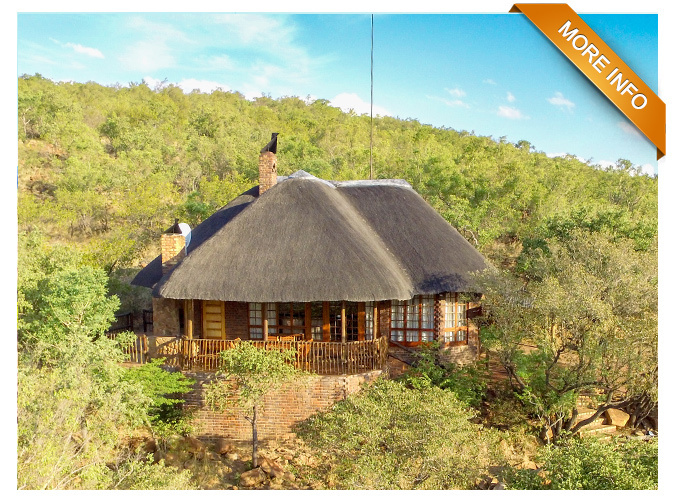 The other similarly decorated bedrooms are situated in their own private Chalets with decks that overlook the Bushveld wonderland. Entrance on upper floor with large open plan living area (fireplace), dining area & kitchen, en-suite main bedroom & store room. Ground floor, 3 en-suite bedrooms, cloakroom, the bar opens onto the deck to rock pool & braai area. Thatched carport plus game drive vehicle. A Shareholders Agreement and Use Agreement set the rights and responsibilities of owners, who will share such monthly costs as the management levy, cleaning, insurance, security, maintenance etc., in proportion to their ownership. Occupation will be based each year on rotating separate weekly allocations, Wednesday to Tuesday. (A January – December calendar will be drawn up to fairly distribute public holidays’, and weeks allocated may be exchanged between owners by private arrangement). Routine cleaning / maintenance will be arranged for Wednesdays, between 08h00 – 17h00, or as otherwise agreed between owners. Other staff / services arrangements required may be made and paid for individually. It is proposed that owners agree that rentals will not be permitted; owners would accompany their guests and accept total responsibility for all their visitors. 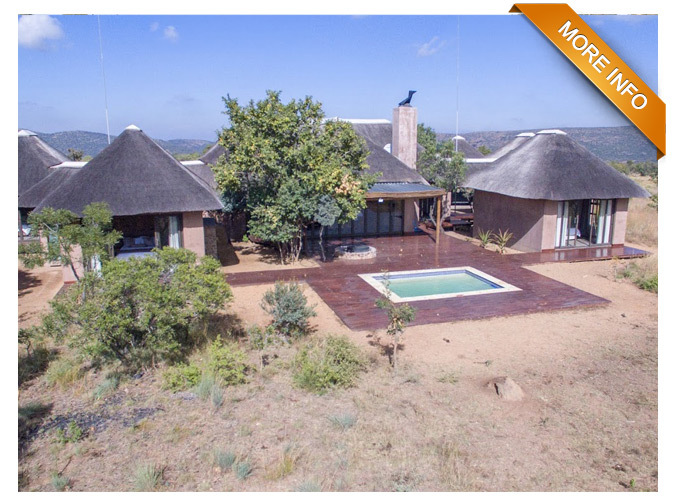 Syndicated ownership of the Lodge is structured through the sales of shares and a share of the loan account of a registered (Pty) Ltd company. Contributions to monthly running costs would be calculated according to each owner’s % shareholding, to be paid by debit order into the company bank account monthly in advance.